A couple of weeks ago, around the middle of March, some of the accounts I manage on Instagram saw engagement drop off by over 50%. It was kind of scary and I rode it out for a day or two to see if it was just a glitch that was being resolved. After seeing no change I did a little digging. 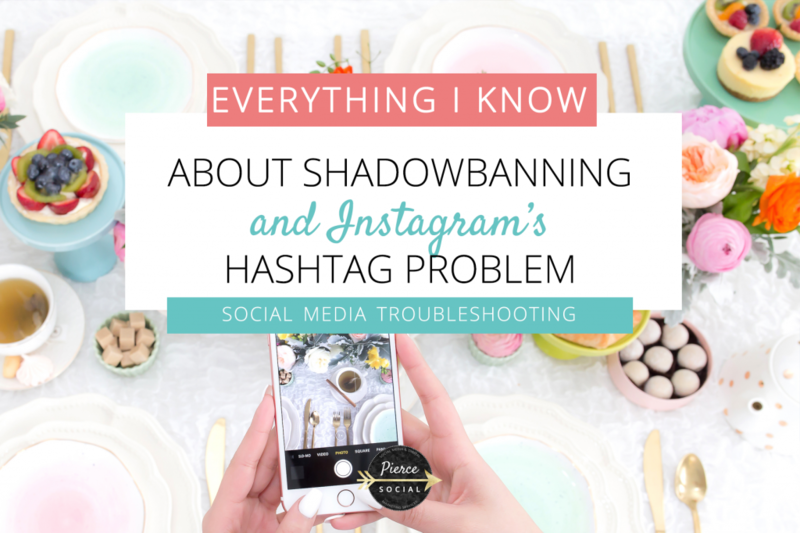 I had seen things about hashtag problems the month prior and heard the term “Shadowbanned” a few times in some of the Facebook groups I am part of. After learning about this I checked the accounts that our engagement dropped on and it turned out that we had been, what others were calling, “shadowbanned”. I am not sure this is even a real thing, but this term explains what people are experiencing when they try to find their photos in a hashtag feed and they don’t appear. It turns out, if you click on or search for a hashtag we thought we would see all of the photos using that hashtag in chronological order (after the top posts section), but we don’t. The accounts that have been “shadowbanned” do not appear in the hashtag feeds even if they have used the hashtags in their post UNLESS you already follow them. So, if you try to find your own photos in a hashtag feed, you will see them, so will anyone that follows you, but everyone else will not see your photos which is kind of the point, right? Join us in our Private Facebook Group & learn from Kaitlyn & other entrepreneurs! Yes, that is what I have been told in a series of emails and a phone call with Facebook directly. Let me back up and explain how I got to this conclusion. March 28, 2017 – Using a hashtag doesn’t mean what you think. This was news to me. Before I started experiencing what people are calling “shadowbanning” I was always able to find posts in the “most recent” section of a hashtag feed under the “popular posts”. So I questioned this asked to schedule a call to walk him through my problem. We had our call and Chad told me he was sending this to his “advanced team”. April 4, 2017 – It’s called “Intended functionality”. This answer is what started to clue me in about the algorithm, however I wasn’t satisfied because I explained this happened with all hashtags, no matter how popular, and with a few different accounts. I explained that the only people that see our posts now are people that already follow us. I asked if that is also Intended Functionality and if it is only business and accounts that are intentionally beginning to be excluded from the hashtag feeds. “After running it by my advanced team one more time, it was reiterated that this is certainly intended functionality. To see posts connected to a hashtag, unless it is a top post or high-volume post, the user must Follow that Page to see the Posts. It isn’t just Business Pages, however, it is primarily. Naturally, I wanted to know what he meant by “personal pages that are in the same category” and how to get our posts to start appearing in the feeds again. I am still emailing and digging a little deeper. I will update this post when I know more. If you have any additional information feel free to drop it in the comments! As I mentioned above, I wanted to know more about how the algorithm works. This is all they seem to be willing to give me at this time. So, if you want your posts to get seen on Instagram it appears you need to do it by continuing to use hashtags but ALSO having those posts be highly engaged with out of the gate by your existing followers. Apparently there are about 6 other variables that they have not told us about that play into determining if your content is shown. This is where forming an Instagram Pod (group of 10-12 people with a similar audience that comment on each other’s posts daily) might be highly beneficial, but we will see how that goes. We have a post on Sundays for forming these kinds of groups in our free Facebook community, The Social Boss Society. Join us anytime!